Looking for a last minute stocking stuffer for your guy? I know that personally, hubby’s stocking is usually the last thing that gets shopped for – mostly because I forget! Sure enough, as I write this, I have stockings filled for the kids and gifts for the kids and hubby but no idea what I’m putting into his stocking. 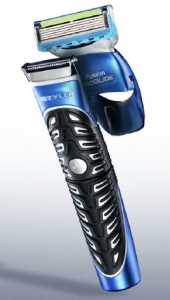 I do have one thing that he’s sure to use and be happy to receive – a Gillette Fusion ProGlide Styler Razor! You still have plenty of time to order off Amazon (it’s $13.47 on Amazon) and have it come in time, and it’s a great price for a razor of its caliber. It’s a 3-in-1 grooming tool for men and it offers incredible closeness and comfort. The three slim combs allow men to trim, shave or comb. It’s sleek looking too, right? It’s also shower safe for the guy who likes to shave while he’s taking his morning shower. Giveaway: I also have a giveaway for two lucky Mommies with Style readers. You won’t get it in time for Christmas but it’ll be a happy surprise for your guy in the New Year! Two winners will receive the Gillette Fusion ProGlide Styler Razor like the one pictured and a Fusion ProGlide Clear Shave Gel. Both winners will be selected at random after January 1st. 1) Leave a comment on this post. 4) Subscribe to my feed or email newsletter and stay on top of all of my daily posts! If you already subscribe, please leave a separate comment letting me know that you are currently a subscriber (thank you!). What: Looking for the perfect stocking stuffer for your man (or any guy in your life)? Find out how Gillette’s products can make a great #GiftofStyle for him this holiday! Join us to chat about the holidays, great stocking stuffers, top men’s facial hairstyles and tips for grooming. If you struggle to find good stocking stuffers for guys every year, you won’t want to miss this party! Disclaimer: This has been a sponsored post. As always, all thoughts and opinions are my own. « Every Day Is a Gift. weekly or more because you really do typically have a number of excellent articles so thumbs up coming from one of your fans. my husband or my son that just started shaving would love me to win this thanks for the chance!! I really think my husband would love this! Thanks for the chance. This would be good for my husband. Thanks.